From left to right, the 5.11 Tarani C.U.B. Master 2.0, Blade-Tech Riptide, and 5.11 Double Duty. The curved blade of the kerambit can be used for arcing, deeply penetrating thrusts. 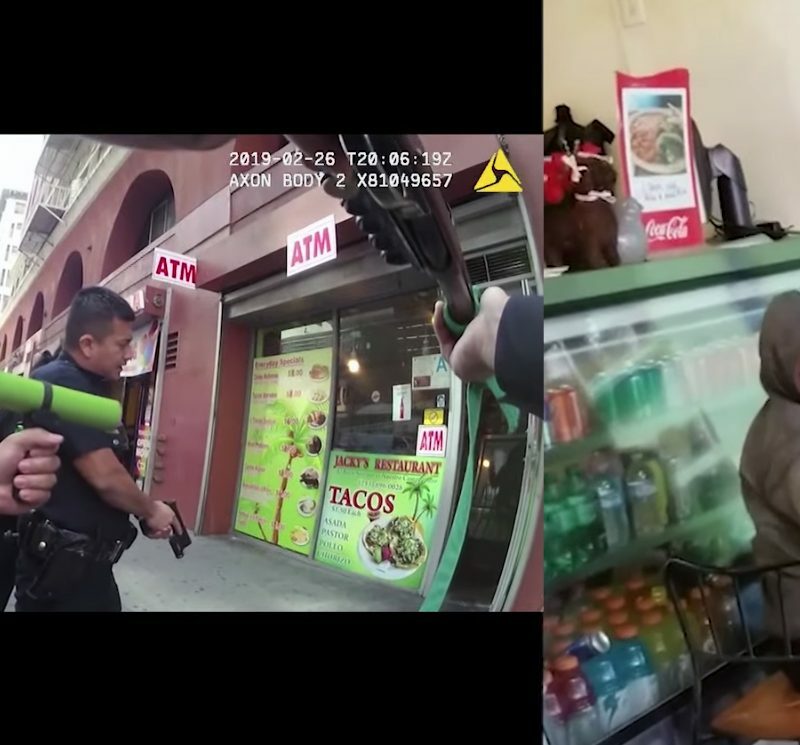 When passing an arm and zoning to the outside, carving a piece of the attacker’s flank is very natural. 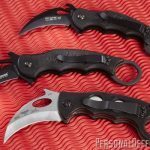 Some years ago, an unusually curved blade called the kerambit or karambit became something of a fad among knife enthusiasts and self-defense exponents. Intended for use in the reverse grip, and bearing a ring for the index finger that enhances retention of the blade, the kerambit immediately sparked the imagination of martial artists and blade-aware citizens who wanted a compact weapon to deliver tight slashing and cutting techniques. 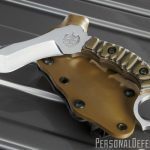 According to Michael Janich, Special Projects Coordinator for Spyderco, and a well-known martial artist, author and knife-fighting instructor, the kerambit was originally a horticultural tool—which is really no surprise, given the traditionally agricultural applications of the hawksbill blade shape. Janich, author of such books as Street Steel and Knife Fighting, a Practical Course, explains that he first became aware of the kerambit in the late 1970s while reading Donn Draeger’s Asian Fighting Arts. He would later encounter the blade again in Southeast Asia, prior to the kerambit’s widespread acceptance among Western knife enthusiasts. “In the early 1990s, while living in Bangkok, I traveled frequently to Malaysia and Indonesia and saw traditional examples in museums,” he says. “That piqued my interest, so I started researching [the martial art of] pencak silat and found a few obscure videos that demonstrated a little bit of their use. 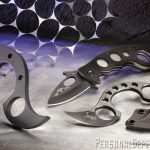 The kerambitd’s rising popularity, propelled by the Emerson Kerambit and other such knives, ultimately, led to the introduction of kerambit models by companies like Spyderco (since discontinued). “The folding kerambits that are so popular don’t really offer any advantages over conventional folder designs,” admits Janich. 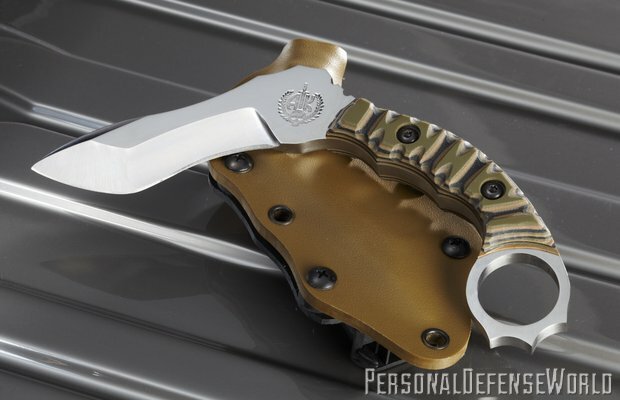 Aficionados of the little blade point out, however, that this “agrarian” design makes the kerambit particularly well suited to infighting techniques. Specifically, the kerambit, held in the reverse grip, can be used for uppercut-like slashes and thrusts while maintaining the elbows close to the body, keeping the body tight and well-defended while bringing in strikes from under the opponent’s line of sight (one of the reasons uppercuts and World War II–combatives style chin jabs are so effective). Lateral strikes are also possible, although the user’s range of motion will be limited by the reverse grip and the angle of the kerambit’s curve. This limitation is seldom confining, given the manner in which the knife is used at close quarters. In a typical self-defense sequence, for example, the defender could choose to slip an incoming blow while also passing the arm with his support hand. Doing so naturally brings the defender’s body close to, and outside of, the attacker. 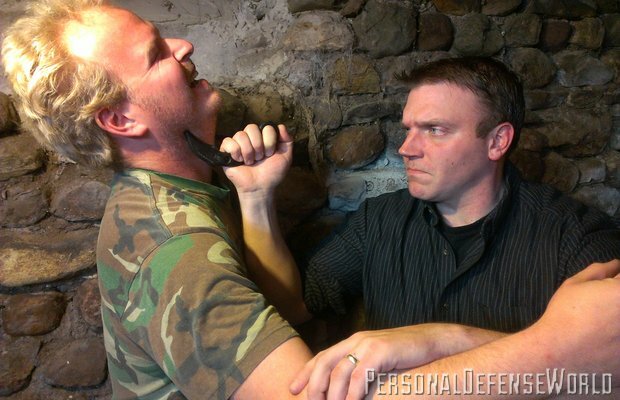 As his right hand moves past the attacker’s body, the defender is well positioned to carve out a piece of the assailant’s flank with the blade of the kerambit. While the curved blade might seem less useful for thrusting, it does make possible arcing thrusts. With a little practice, the user can lever the blade in with a shovel-hook motion, resulting in deep, penetrating strikes. The retention ring can be used as a strike enhancer (in the fashion of single-finger brass knuckles). Spinning the kerambit outwards allows the user to cut at greater distance, which Janich says can be a useful surprise tactic. 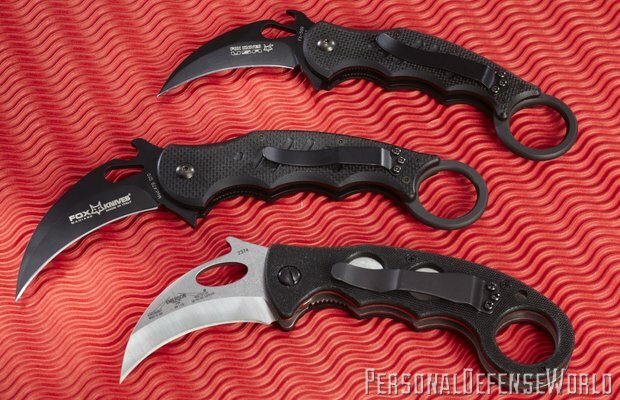 “Repositioning the kerambit with a spin can also allow you to pull a cut toward you, a tactic often used from the ground against the Achilles tendon,” he explains. Such a method can also be used for making “deboning” slices to an attacker’s limbs. There are multiple fixed-blade and folding kerambits on the market. If you are right-handed, however, the attempt to find a high-quality folding kerambit that can be drawn into a reverse grip (as the knife is intended to be used) can be frustrating. The consumer is limited to only a few models that make provision for positioning the pocket clip for reverse-grip, right-hand deployment. This is because many kerambits on the market, particularly the cheapest ones, position the clip in a more “traditional” forward-grip location, as if the knife were simply a folding hawksbill (which is why these very same kerambits are set up perfectly for left-hand draw in reverse grip—to the right-hander, meanwhile, the clip is oriented with the blade pointed to the rear of the knife if the ring is up). 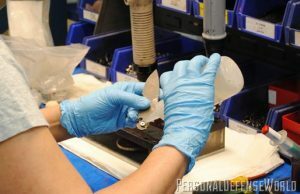 A typical selection of commercially available kerambits includes several folders with multiple-position clips, curved blades with a variety of profiles, and some variation in handle materials and overall ergonomics. 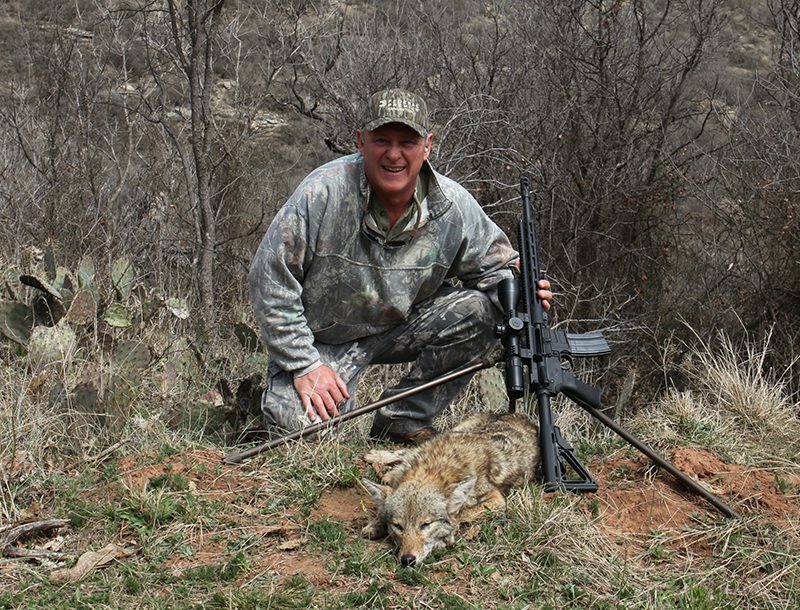 Fox Knives, which manufactures the Fox, 5.11 and Blade-Tech kerambits, offers the buyer multiple choices under one roof (if spread across multiple brands). Its large and small G10 Fox kerambits have reversible clips, integral guards and licensed Emerson “wave” openers. The heavier Mike Vellencamp-designed Blade-Tech “Riptide” features an extra scallop in the blade for brutal slicing and ripping, while the Steve Tarani 5.11 C.U.B. Master 2.0 features nicely textured handles and a large, broad finger ring for enhanced control. Buyers who want something truly unusual can select the 5.11 “Double Duty,” which has a conventional straight blade and a smaller, auxiliary kerambit hook that open and lock separately. Emerson’s kerambits, which of course incorporate the “wave” pocket opener, remain immensely popular and can be had in both traditional curved and “bullnose” blade patterns. (Emerson also offers a DVD instructional series in which Ernest Emerson demonstrates the use of the blade.) For users who want more “control” options, there are Louis Krudo’s SNAG and SNAGette tools, the inner curve of which are blunted and grooved for this purpose. Those buyers wanting a fixed blade need look no further than Airborne Knives’ Methos and Ghost models, beautiful tool steel blades that feature pain-compliance ring notches and a double edge, respectively. 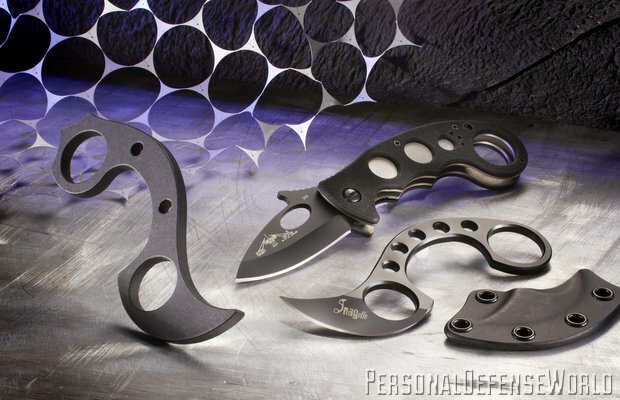 While the kerambit’s popularity has waned somewhat since it’s introduction as a “mainstream” product, it is now a permanent fixture of the industry, offered by multiple manufacturers and custom or semi-custom makers. 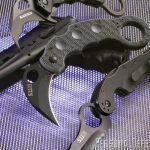 While not conceived of as a weapon, the kerambit excels when used for just that—in tight and at close quarters, which is exactly where self-defense is most critical and necessary. 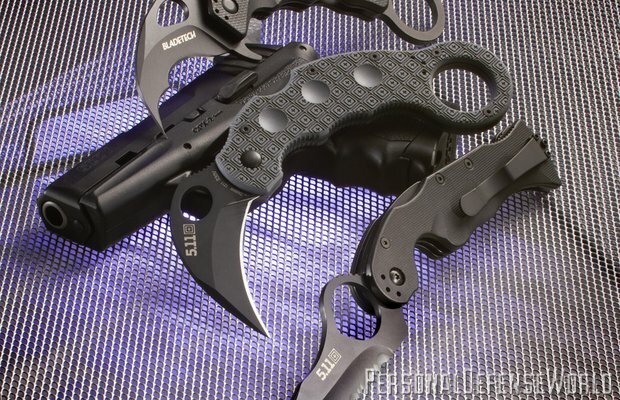 Expect the kerambit to remain a noticeable feature of the Western edged-weapon landscape.